After reviewing the Oppo HA-2SE I got a number of reader requests to review the very portable AudioQuest DragonFly DAC/headphone amps. 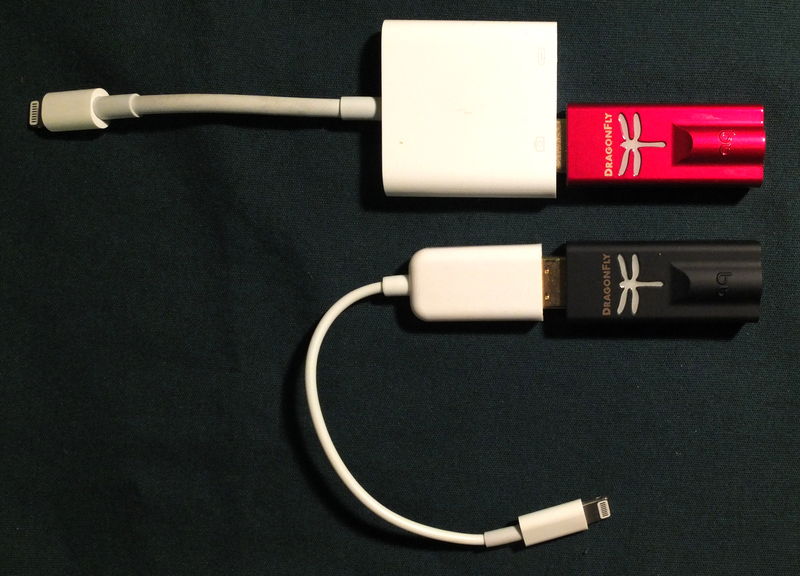 AudioQuest is systematically conquering the USB and phone DAC market with the neatly packaged and marketed DragonFly Black ($99) and Red ($199) models — for the headphone-jack-impaired iPhone 7 owner (or any iPhone/Android owner for that matter) these are enticing options for getting better sound and avoiding the sketchy (from sound quality POV) Bluetooth approach. Are these wonderfully streamlined products worth it? The simplicity is appealing, without a doubt, and the lack of bulk should make these a slam dunk. I fondly remember selling AudioQuest cables and turntable accessories (remember Sorbothane?) when I worked with Alan Goodwin at Goodwin’s High End in the 1980s. AudioQuest has taken the time-honored and quite valid approach of creating a line of products from a single basic design which share the same shell, connectors, and likely a PC board, but differ in the “goodness” of the actual digital-to-analog converter, the headphone amp, as well as the volume control system (which turns out to be a non-trivial difference). The Red model is finished in spiffy metallic lacquer paint, and the black model is soft-touch black paint. Both look good. If your goal is listening to your iPhone, using either DragonFly will require you to buy Apple’s Lightning to USB Camera Adapter ($29) or Lightning to USB 3 Camera Adapter ($39). Apple generally promotes these as adapters to attach your digital camera to an iPad, in order to move photos from camera to the iOS Photos app. You can do this on an iPhone as well, so this is a handy benefit of buying the adapter for your new DragonFly. You can also order cheapo Lightning to USB adapters from eBay; the one shown in the photos cost about $3 including shipping from Shenzhen, China (eBay, 2-3 weeks delivery). If you order one of these adapters from Shenzhen, or Hong Kong, or Singapore, it will likely work fine, but will be fragile and won’t last as long as the Apple adapter. So order two or three. To use the AudioQuest DACs with your computer, you just plug into a USB jack and you’re done. Right off, a concern I had was phone battery life, but in my non-scientific testing, I did not notice appreciable additional battery consumption when I used the DragonFly units. I did notice two downsides, however, and both were pretty irritating and would cause me to think twice about owning the products. The first is that I frequently had to re-boot the phone to get it to recognize either DragonFly model. This situation was more severe with the Apple USB 3 adapter. In other words, I had a slightly better experience with the discount adapter. The other effect I noticed with both adapters and both DragonFly models is that there would be a sharp pop and the sound would mute — this occurring when I kept the phone and DragonFly in my jacket pocket — I attribute this to static discharge causing electromagnetic interference sending the DragonFly into a fault mode. A few seconds later the audio was back; sometimes I would have to push “play” to get sound again. 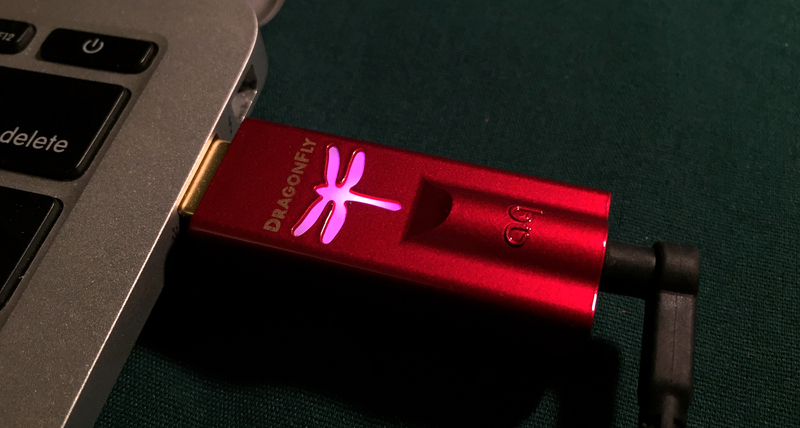 Note that neither of these issues occur if you use the DragonFly as a DAC for your computer. For a reference I used the Oppo HA-2SE DAC I reviewed a few months ago and liked a lot — the Oppo is pretty easy to use and has the added benefit of a battery that can charge the phone, albeit at a $300 price tag. 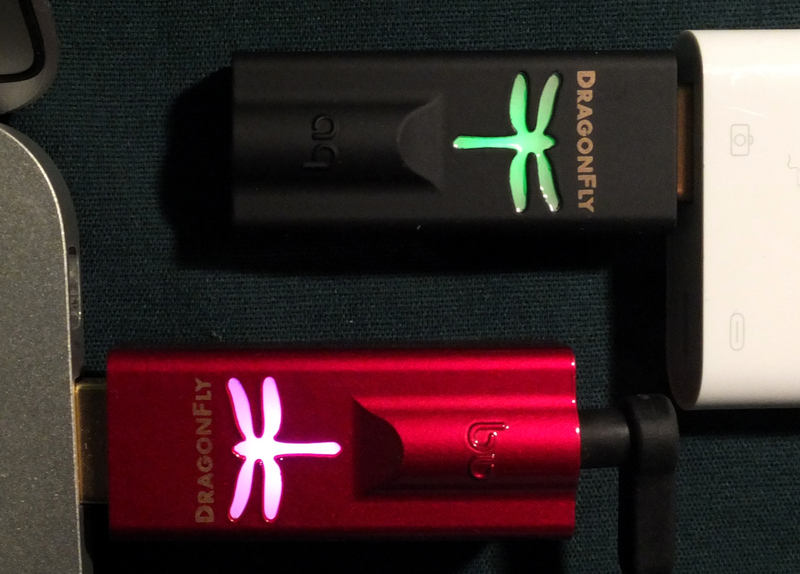 First, I compared the two AudioQuest DragonFly models with the Oppo with the output of the computer (44.1 kHz AAC recording — nothing exotic) of the Keb’ Mo’ song Angelina, a nice punchy acoustic tune. In this case I though the Oppo and DragonFly Red were both pretty good, and both a lot better than the DragonFly Black. The difference is attributable to the volume control. Normally with any digital volume control you want to keep the levels as high as possible to the last step in the chain, so you retain the “bit depth” of the recording. I was using iTunes as the audio player with a MacBook Air, with the iTunes internal volume setting near max. The Black model seemed to have a lot more gain and thereby required a much lower volume setting for a comfortable listening level (the Dragonfly’s volume is is set from the computer’s volume control, as distinct from the iTunes control). The Red model required a higher volume setting for the computer (really, it’s the Red’s control), with the iTunes control still set the same. Frankly the Black seemed grungier — not a lot, but enough to cause concern about the fact that I had to set the Black’s volume so low. I could turn it up, but then I had to turn down the iTunes control. This is a curious situation, since the Red is advertised as having higher output (it can drive headphones that have a lower voltage sensitivity and need more voltage input to hit an appealing level). The Black’s higher gain made it seem louder in this situation, kind of like a lower horsepower car that has a very touchy gas pedal. On the other hand, listening with an iOS device, I found no such discrepancy in volume settings between the DragonFly Red and Black. The relative volume levels were essentially the same. In the iPhone case you set the volume from the phone’s controls (and not from your headphone’s controls — keep in mind the headphone’s controls and microphone are disabled when you use a DragonFly or other outboard DAC — except Apple’s little Lightning to headphone adapter). As for listening, I’m a Neil Young fan and I especially appreciate the quality of his recordings (he needs to sell those Pono players, which I haven’t had a chance to try). His latest record Peace Trail is actually quite accessible by modern Neil Young standards. It’s also a great recording, with extremely natural sounding drums (played fairly gently and subtly) and guitar. If you listen through the first minute or so of the song Indian Giver you have a percussive underpinning to Young’s voice that covers a broad set of textures of the drums and cymbals. The song The Pledge has Young overdubbing himself on vocals (kind of weird and and mysterious, and an interesting test of how you can hear the different recording spaces of the vocals and percussion). With this recording I head the DragonFly as being clearer, even maybe a bit brighter tonally, seeming to have a more solid sense of a center image. The Red and the Oppo seem similar with this test, with the Black lagging a bit but still quite good. On the Neil Young recordings and many others I find I could be happy with either DragonFly, but I definitely prefer the Red. As for what I would buy (or recommend), for phone use I prefer the Oppo HA-2SE at $299 to the $199 DragonFly Red (assuming an added $29 for the Apple adaptor). 230 isn’t so far from 300, and for 300 you get a device that can charge your phone and frankly is a lot more bulletproof and hassle-free. The Oppo battery feature is pretty valuable if you routinely stream audio over a cell connection as I do. The Oppo is not perfect, but it mostly just runs, while the DragonFly models always make me wonder “will I get audio this time, or will I have to reboot the phone, again.” On the other hand, the DragonFly models are more compact, and if you use the Apple Lightning to USB 3 Adapter, you can also hook up a charging cable (though that’s a mess of wiring). For use only with a computer, I probably would just use the Red and not the Oppo, since the battery feature adds no benefit and the DragonFly units seemed very reliable used with a computer. Between the Red and Black I prefer the Red but the Black is a solid bargain option, especially if for your iPhone you pair it with a cheapo USB adapter to keep the cost down. This entry was posted in Product Design, Reviews and tagged AudioQuest, DAC, DragonFly, Oppo by Stephen. Bookmark the permalink.